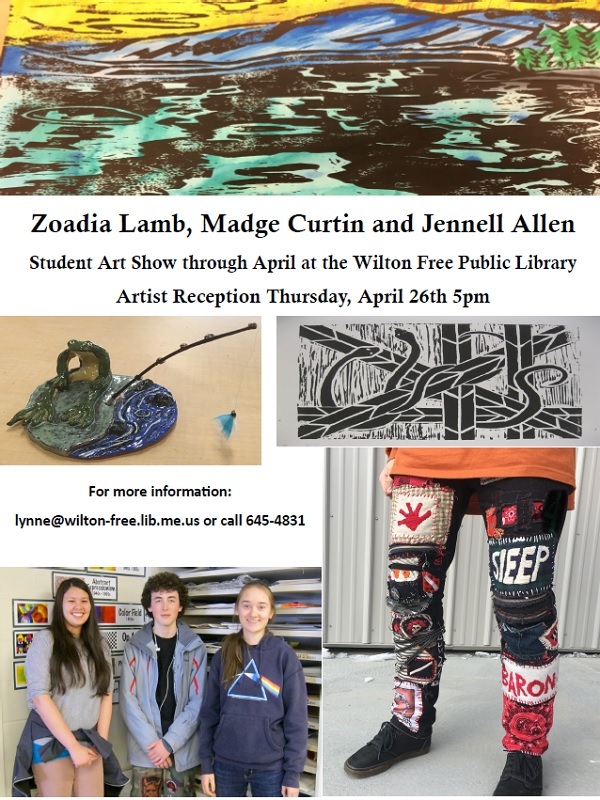 WILTON - The current art show at the Wilton Free Public Library features artwork by three Wilton Mt. Blue High School students, Zoadia Lamb, Madge Curtin, and Jennell Allen and will be displayed through April. An artist reception will be held on Thursday, April 26 at 5 p.m. The artwork on display includes diverse mediums including watercolor, oil pastel, printmaking, ceramics and textiles. All three artists have been studying art for several years and their work reflects their love of art and the mediums that they work in. Come in and enjoy the diversity, color, and beauty of their work. For more information visit www.wilton-free.lib.me.us or call 645-4831.